LLview is extremely flexible. All components and graphical elements are configurable and LLview is able to deal with different settings for different SMP clusters. llview.rc in the installation directory of LLview. This file contains the system-wide settings, which should be adapted to the system LLview should monitor. a local .llview.rc configuration file in current directory or in HOME directory of the user. LLview loads at first the system-wide llview.rc and after this the user specific configuration files. 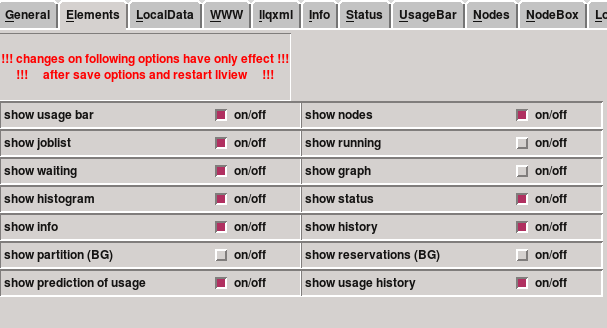 The option panel of LLview allows the user to change the configuration options and to load/save different configuration files. The option panel contains for each GUI element a separate sub folder (see next section). The option panel can be started through the Option menu of the main window or the key binding Ctrl-o. The path and the name of the actual user specific configuration will be displayed in above the button row. This file for example will be used for the next Save action. Most changes in the Option panel will have a direct effect in the main window. Exceptions are options about the data source -- they will have effect at the next data access -- and the options in the Elements subfolder -- they will have an effect only after restarting LLview. For many options there is a tooltip help available. Just click on the label of the option in order to show the corresponding help for the particular option. Remarks: Coordinates are given in pixels. The 0,0 point in the main windows is the upper left corner. Each numerical entry object has two additional buttons ('+',-') which in-/decrease the value in blocks (e.g. +-10,+-100). These buttons can be disabled in the General options tab. There are additional key bindings if the focus is set to the numerical field. You can use the cursor keys (Up: +1, Down: -1 ) and the Page keys (depending on each field, e.g. Up: +100, Down: -100) for adjusting the actual number. The general subfolder contains options elements for the data access, the general layout of the main window, the update time and the auto play mode. The data source option describes the mode of the data flow in LLview. If the option WWW is selected, LLview uses the HTTP protocol to request the data from a web server. All configuration parameters for the web server are to set in the subfolder WWW of the option panel. If LLview is executed on the supercomputer itself, the server part llqxml of LLview can be executed directly. The path to the llqxml command has to be set in the subfolder llqxml. It is also possible to execute llqxml via Secure Shell (ssh). The third option LocalData can be used to read recorded data from flat files or tar-files (see documentation of the LocalData subfolder). Switching on the verbose flag gives a lot of debug messages on stdout. It's only useful for debugging LLview. With the demo version checkbox you can activate that usernames are anonymised. This could be used to show LLview's output to a public audience without revealing internal user data. 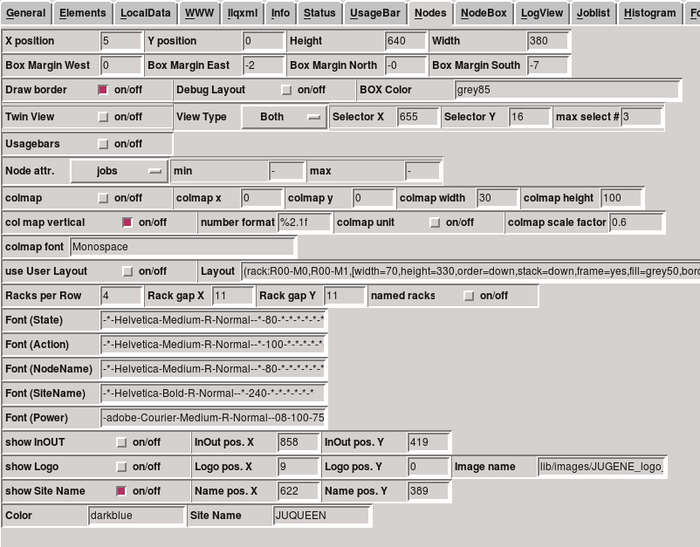 The options Height, Width and Height(Lines) define the size of the main window of LLview. The effects of these options depend on the used windows system. Canvas color defines the background of the main window. The entry Mark Color defines color for marking the corresponding job in the job list. Mark width defines the line width for the border of marked processor boxes. LLview updates automatically the display by requesting new data from the data source. The options Update and Update time can be used to enable this feature and to set the time delay between two updates. The options Autoplay and Autoplay step are only needed if LLview is used for display panels. Enabling Autoplay lets LLview mark automatically different jobs in the monitoring display. This panel can be used for switching different display elements on or off. Changes are applied after restarting LLview. Disabling a component causes corresponding option tabs to be removed after restart. In the same manner the option tab for a recently activated graphical component is not presented until restart. The elements are described on the page -> Using the LLview client. This panel can be used for reading recorded data from files. There are two different modes: The first one is to read from flat files in a specified directory. The second is to read from one tar file, which contains compressed XML files with the data. LLview will step to the next configured file on every update. As a result, this allows to replay the data recorded in the past simulating a live monitoring visualization of the target system. Reading data from tar-files is more efficient because the XML files in the tar file are compressed. The files have to follow a naming scheme and have to be numbered (according to option Filename Mask). Data can be recorded directly by LLview when LLview executes llqxml on the supercomputer (see Option subfolder llqxml). The first three options define the range of available numbers of files in the directory or the tar file. These parameters are adjusted automatically if a new directory/file is selected. The step width allows to step faster through the recorded data. E.g. for a step of 2, only every second file is displayed. The actual number counter will be reset to the starting number after requesting a file with a number bigger than max number. Path to directory defines the directory, from which plain XML files are read. The Select button provides a file dialog for this. File (tar) defines the tar file containing compressed XML status data. It is only used, if the data source option selects to read from a tar file. The Filename Mask is used for both directory reading or tar file reading. It defines a mask in printf format for the filenames. E.g. for a directory containing the files ll_0001.xml..ll_0099.xml the filename mask should be set to ll_%04d.xml. For a tar file the contained files are expected to be zipped files each. If the tar file contains the files 000001.xml.gz..001000.xml.gz the filename mask has to be set to %06d.xml. The ending .gz needs to be omitted here as these files are mandatory to be zipped. The last user changeable option is the entry actual number. This number is used in combination with the Filename Mask. It selects the inner file of the directory or within the tar file. The number can be changed in the number field or with the scrollbar. Changing the scrollbar has only an effect after clicking the select button. In the number field you can also use the cursor keys (Up: +1, Down: -1 ) and the Page keys (Up: +100, Down: -100) for adjusting the actual number. This subfolder defines the location of the web server, which hosts the llqxml/LML_da XML data file. If the data file is protected with a .htaccess file an additional userid/password check is necessary. These credentials are provided with the client's configuration file. On JUQUEEN the command llview_getaccess prints them to registered users. These options are only relevant if the data access method "www" is selected in the subfolder "General". The first entry specifies the hostname of the web server. The protocol prefix http:// will be automatically prepended for building the web address. The second entry gives the path to and the name of the XML-file on this web server. The last options have to be used if the XML file is protected by a userid/password authorization. This subfolder defines the location of the server command llqxml. If LLview runs on the monitored machine itself, LLview can execute this command locally. Otherwise, it is possible to use the Secure Shell to execute the llqxml command on a remote machine. LLview allows to store the XML data in flat files or tar files as history to be reviewed again. Storing the data in flat files requires a lot of disk space. It is better to store the data in a tar file because LLview will compress the files. Such recorded data can be accessed with the third data access method "Local data". These options are only relevant if the data access method "llqxml" is selected in the subfolder "general". The first entry specifies the complete path and the filename of the server command llqxml. The next three option define the parameters which will be needed for executing llqxml via SSH. You can either store the XML snapshots in plain files in a directory or place them into a tar file. The Filename Mask attribute is used for both store modes and defines the structure of file names. The field actual number can be used to reset the file number which will be automatically increased with every update. The last field shows the actual used filename for storing the data. This subfolder provides options to adjust the layout of the Info box in the main window of LLview. The Info Box is an ASCII based display element, which provides additional information about the object which is currently focused by the cursor. By moving the cursor the information in the box is be automatically updated. The position options describe the position of the upper left corner of the Info Box (in pixels). The next two parameters describe the size of the panel. These values are given in number of lines or number of characters. The next four parameters define the colors and fonts for displaying the text information. The status bar shows the progress to the next data update. It is formed by a label showing how many updates have been shown since this LLview client was started and a progress bar indicating the time to the next update. 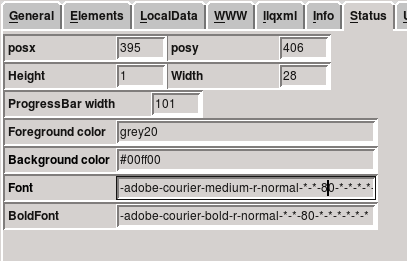 In its option panel you can position the bar with the posx and posy attributes. Height and Width are provided in number of lines and characters. The option panel also allows to change the width of the progress bar. In addition, the common attributes for color and font choosing are available. The Usage bar shows the utilization of the whole machine. The jobs are marked as small rectangles and are sorted by job size. The options allow to adjust the position and the size of the usage bar. 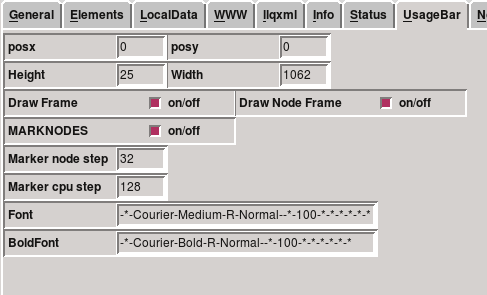 You can configure to draw frames around the job rectangles with Draw Frame and you can enable a scale showing the compute node borders with Draw Node Frame. The MARKNODES option defines the unit of the usage bar's scale. If enabled, the scale uses compute nodes as unit, otherwise CPUs are used. The two Marker step options allow to change the distance between two tick marks. The node display is the central element on the main window of LLview. It contains for every node of the LoadLeveler controlled cluster a box displaying information about the node. Each node has processor boxes for each processor of the node. The size of such a node box depends on the number of node processors and the arrangement of the elements within the box. This subfolder Nodes defines the global arrangement of the node boxes. The arrangement of the elements in a node box are defined by the next subfolder "Node Box". To display the nodes LLview sorts the nodes by size (number of processors) and assigns the position of the node boxes like a text processing system: from left to right and line by line. This allows LLview to display nodes with different sizes in one node display. For an advanced layout a user defined layout can be configured with the Layout option. Here the nodes are assigned to racks, which are placed in a grid layout. Each rack can be configured with many options such as its dimension, the ordering of nodes or a background image. The arrangement of racks can be configured with the attributes Racks per Row, Rack gap X/Y. 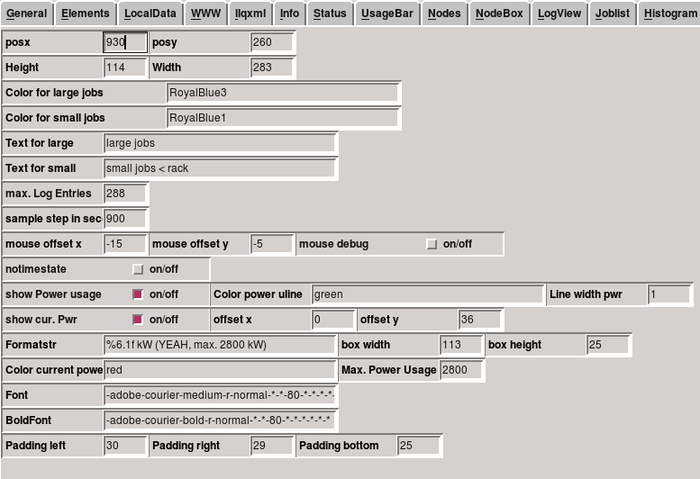 The first four options define the position and size of the whole node display relative to the main window. A border indicating the node display's bounds is displayed, if Draw border is activated. The margin options define the margin around each node box in each direction. For a fine adjustment of the boxes the next option "Debug Layout" can be helpful. It marks borders of the node boxes with a green line. The next option "BOX color" defines the color of a node box. It should be always the same as the background color of the main window. 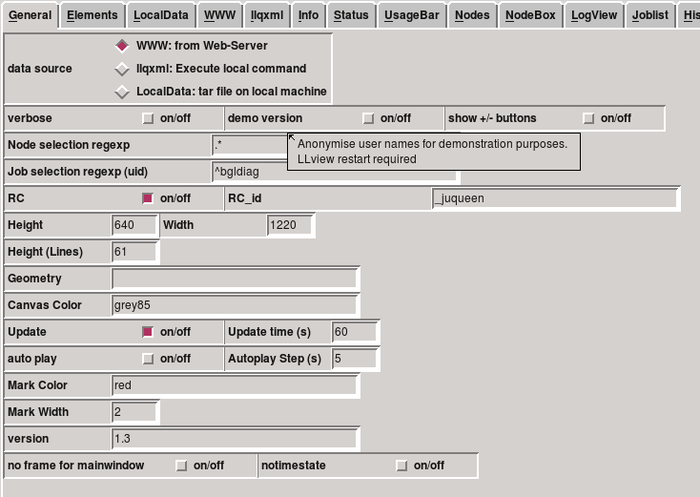 A logical node view is available for BG systems such as JUQUEEN. It shows the midplane links of the torus network by placing connected midplanes next to each other in the corresponding torus dimension. This view can be activated via the Twin View option. A selection box for the view mode is then drawn at the position defined by the Selector X/Y attributes. The node display can also be used for showing scalar node attributes. Examples for scalar attributes are power usage or temperature of nodes. They are attached to the node data given with the input XML file. If such attributes are available in the data, they can be chosen from the Node attr. option. The minimum and maximum values are reset to the default values every time you select one of the entries. Per default the job is used for mapping a color to a node. Here you can select, which node attribute should be mapped as color value to the nodes. 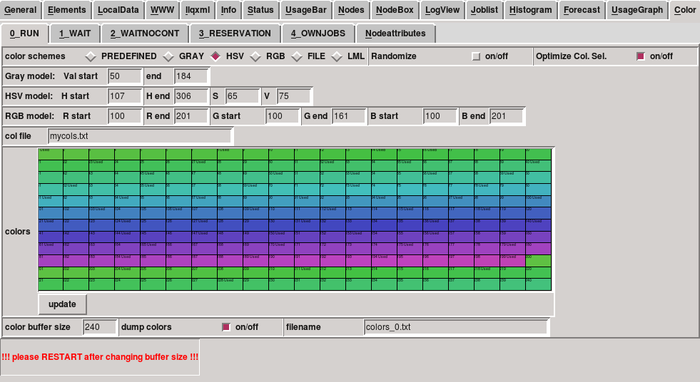 A colormap can be drawn as legend attached to the nodedisplay. Similar to the preceding view configurations you can configure font styles for all fonts used in the nodes display. The two options InOut pos.X/Y define the position of the three small InOut boxes. These boxes are mouse sensitive. If the mouse pointer is moved over one of these, LLview shows the corresponding information in the Info box. As additional annotation a photo of the parallel system or its logo can be drawn by the nodes display. You can also print the system name at any position on the LLview screen. This subfolder defines the options for the arrangement of the elements within a node box. The layout depends on the number of node processors. The subfolder is split up again in multiple similar subfolders ("4","8",...). Each of them is responsible for nodes with processor numbers up to the number displayed in the label (#1-4 -> "4", #5-8 -> "8", ...). The BGL subfolder is especially used for Blue Gene systems. 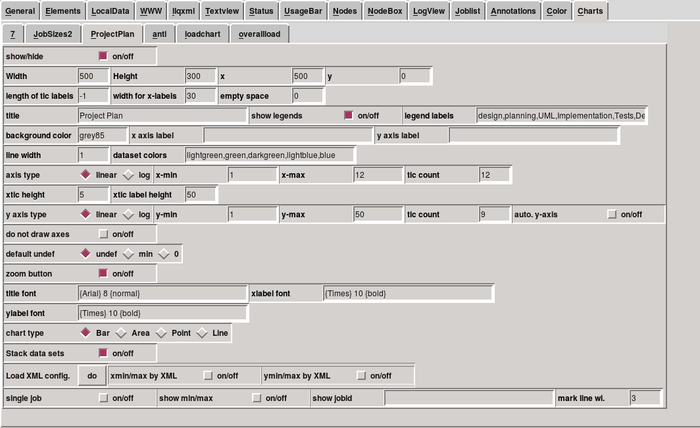 It provides additional options for placing midplanes in rows and painting textures on each nodeboard rectangle. All coordinates in this subfolders are relative to the node box. The (0,0) position is the left upper corner of the node box. The size of the node box is calculated as a bounding box by LLview. The first two options Proc. Box Width and Proc. Box Height define the size of one processor box in pixel. The parameters Proc.rel.pos.X/Y define the position of the processor boxes within the node box. The next four options describe the display of a machine picture in the node box. This is only useful if the node size is large enough and there are not so many nodes to show in the node display. The following options describe the positions and sizes of the other elements in the node box. These are the memory and cpu usage bars, the status box, and the name of the node. You can also position GPU boxes in this options page, if the corresponding data is collected by LML_da. Each parameter of this variety of options is documented via the tooltips available by clicking the cursor on the particular option label. The logical view provides a pseudo-3D view on the torus interconnections in Blue Gene systems. It renders the midplanes in their logical locations within the torus network. In this option panel you can configure the location of this logical view, the width and height of the node name labels as well as additional parameters for the setup of the 3D effect. The Job list shows information about the running jobs on the cluster. With this subfolder the position and size of the Job list as well as its columns can be arranged. The system type selects the set of job attributes and default column widths. For each of these types a different set of available job attributes is presented to the user. The following four options describe the position and the size of the job table. If the number of jobs is too large to fit in this window, LLview adds a scrollbar on the right side of the table. The option LineHeight defines the vertical distance between two lines. Make sure, that the font size fits well into one table row. The option autoscroll enables the automatic movement of the scrolled list to show the marked job. This is only important if the list is too long to fit in the job list box. The job will not be marked if this option is not enabled and the information about the currently marked job is not in the visible area of the job list. In this option panel the position and content of the histogram group is configured. Each histogram shows the distribution for a single job attribute. It lets you display the distribution of waiting time, number of CPUs, number of CPU hours (the product of used CPUs and wall clock limit), number of job hours (regardless of used CPUs), the current time duration jobs are running and the distribution of used queues. On the x-axis the range of one of these job attributes is displayed. The jobs are grouped into discrete classes and for each class a bar is rendered. The height of the bar is in most cases defined by the number of jobs in the particular class. But you can also use the number of CPUs, CPU hours or job duration for calculating the contribution of each job. This is for example helpful, when the number of CPUs is more informative than the plain number of jobs. If the distribution of jobs among queues is shown, it might be more interesting to see how many CPUs are assigned to each queue rather than showing only how many jobs are in each queue. Both axes can scaled linearly or logarithmically. Moreover, the histogram panel is a group of different single job distribution diagrams. Via selection buttons on the left the current histogram can be selected. When autoplay is activated, LLview traverses all configured histograms in a given interval, which can also be configured in this option panel. There are many options for arranging the histogram group, its selection buttons and diagram legend. Similar to the other components you can also choose the font styles and used colors in the histograms. Note, that the top half of this option panel configures parameters specific to each diagram. 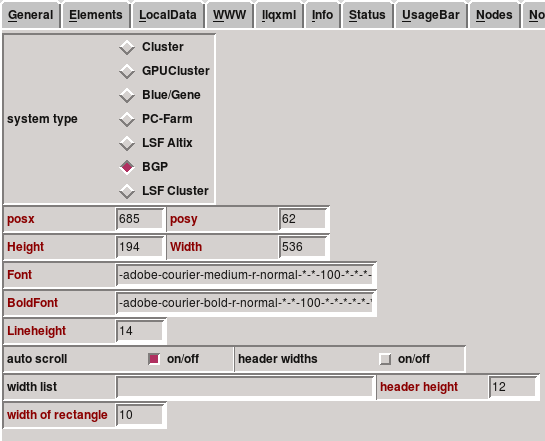 The bottom half contains global options like the location of the histogram group or the used fonts. General: positioning and display options of the prediction view. Simulator: allows to run the scheduler prediction locally. Contains parameters for the simulation. Snapshot: make snapshots of the LLview window. Configure how often a snapshot is taken and where to store it. In the General sub folder the position and size of the prediction view can be configured. The presented time range is configurable as well as the algorithm for arranging the predicted jobs (Vertically Arranger). Furthermore, special jobs in so called no contingent queues can be highlighted. The diagram area can be split by using the regular expression for small nodes option. This allows to show for instance small interactive jobs on top of the diagram in order to keep the main diagram clean from small job rectangles. 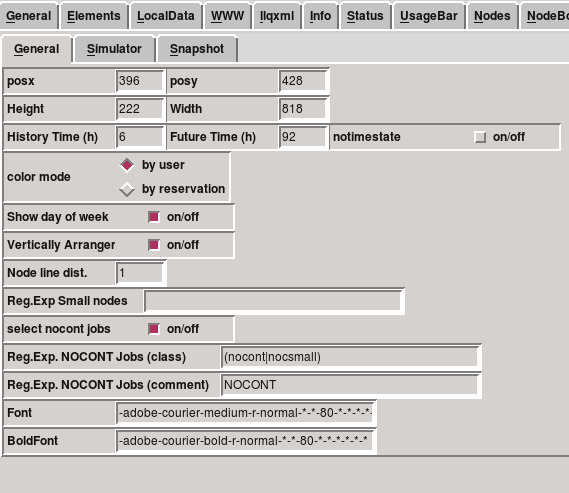 Option panel "Forecast->Simulator": configure the scheduler simulation when run locally. The Simulator panel allows to run the job scheduler simulation locally. In the default setting LML_DA should run the scheduler prediction as part of its workflow. But, if users want to test different simulation parameters, it is also possible to run the simulation via this option panel. The force simulation option should be activated in that case in order to ignore pre-calculated prediction results. This option panel allows to generate many debug outputs and to configure the main simulation parameters such as backfilling, the number of top dogs or the maximum number of scheduled jobs. Running the simulation locally might be especially interesting for system administrators as they can safely test the impact of changing the scheduler's configuration. The simulation is run on live data snapshots. Option panel "Forecast->Snapshot": make snapshots of the LLview window. The third sub panel is not necessarily connected to the forecast option panel. It is planned to move this option panel to its own top level option panel. It allows to take snapshots of the LLview window at regular intervals. If you want to take a snapshot after every update (every minute) activate the Screenshot after update option. Also activate use counter for fn in order to generate one file for each snapshot. Otherwise LLview overwrites the last snapshot on every update and you will get only one snapshot holding the state of the latest update operation. This panel can also be used to animate the scheduler prediction. Therefore, the simulation needs to be run locally and the maximum number of jobs simulated has to be set to a low value in order to start the animation. Afterwards, the option loop over maxnum increases the maximum number of inserted jobs in a fast interval. After each new inserted job a snapshot is created, so that all of these screenshots form an animation of the schedule prediction. The screenshots are placed into the screenshots directory, which has to be created manually in the working directory of LLview. Similarly to creating an animation of the scheduler prediction, it is also possible to make a video of an entire day on the monitored system. Therefore, LLview can be started with a history tar file, which is traversed with every update. In order to quit LLview as soon as all snapshots are taken the max shots till exit option allows to configure the greatest file index of the history file. When that index is reached the LLview client is stopped automatically. This allows to start the LLview client in a kind of batch mode especially for generating history animations. This option panel configures the histogram view. It allows to position the view, change its colors and font styles. The view displays the load history of the last days separated into two categories: small and large jobs. LML_DA and its configuration define, which jobs are placed into each category. That is why this option panel allows to configure the legend labels for these categories, because the meaning of the categories varies for different systems. The history view also incorporates a power usage history line, if the corresponding data is collected. In addition the current global power usage of the supercomputer can be displayed in a special label within the history view. The history view provides detail data for each log entry when moving the cursor on the diagram. With the mouse offsets you can configure exactly the position focused by your cursor in the actual data. This allows to select data for instance slightly to the left of the actual cursor position, which might be more comfortable than selecting data, which is occluded by the cursor. RUN: colors for running jobs, used in many views. WAIT: colors for waiting jobs, used in prediction view. WAITNOCONT: colors for waiting jobs in no contingent queue, see the Forecast option panel for documentation. Reservation: colors for reservations displayed in the prediction view. Moreover, a special subfolder Nodeattributes allows to configure color maps for visualizing node attributes with the node display. PREDEFINED: Use a set of colors defined in the color module. The number of colors in this scheme is limited. HSV: use HSV color space to define the color ranges. Traverses the hue range and keeps saturation and intensity the same as long as there are enough colors available. RGB: traverse the RGB color space within the ranges defined by R start/end, G start/end and B start/end. At first traverse the blue range with red and green fixed. Then adjust the green value by one and traverse the blue range again. FILE: read colors from a color map file defined by the col file option. The file contains an ID and one color separated by white space in each line. E.g. " 23 ForestGreen " would be a valid line. LML: read colors from input XML file. There are no further options for this color scheme as the configuration is done in LML_DA. For the color schemes GRAY, HSV and RGB, value ranges for the respective color space can be configured. These ranges are traversed in order to generate the required colors. E.g. for the GRAY scheme, the minimum and maximum intensity can be chosen, so that only gray values in this range are used. A preview of the configured colors is shown, too. Colors are generated based on the configured color scheme on the start of LLview or after changing the color scheme. The colors are not generated dynamically. This is done for optimization reasons. Therefore, the number of colors needs to be known. The maximum number of usable colors is defined by color buffer size. Make sure, that this value is larger than the number of objects (jobs/reservations) using these colors. Otherwise the red color is assigned to objects, for which not enough colors are available. Restart LLview after changing this value. In this option panel the color map of scalar node attributes to a corresponding color is configured. The transfer function is chosen by value to color, which allows to select a heat, gray scale, rainbow or green-black-red color map. The best choice depends on the use case or node attribute type. A heat map is useful for visualizing temperature, the gray scale can be intuitively interpreted, the rainbow scale covers all hues and green-black-red visualizes the variance around a mean value. The undef color indicates nodes, for which the attribute is missing. With the LUT options an additional contrast enhancement on a given range can be set. A preview of the used color map is shown on the bottom. This subfolder is responsible for the History panel, which is currently in an alpha state. This panel is located in an additional subfolder of the main window. It shows the history of the machine utilization since LLview is started. The first four parameters define the position and size of the History element relative to the main window. The option "Min. Cpus." defines a limit for the number of CPUs for a job to be displayed. If the number of processor used by a job is larger, the job is displayed a a single colored strip in the History chart. If the number of processors is lesser, these processor are added to the grey strip at the top of the history chart. The option "Part in Percent" describes how much of the horizontal distance for one timestep should be used for connecting the upper and lower egdes of the job rectangles to the egdes of the last entry. These connection lines are usually not horizontal. Therefore this option is a parameter for the smoothness of the strip. The option "max cols" defines the maximum number of columns in the history chart. Reaching this limit, the chart will be scrolled by removing the oldest entry. The option "Update step" gives a minimum distance between two updates (in minutes). If the time since the last update is smaller, the actual data will not displayed. The option "... STEP" defines the number of update steps between to markers below the chart (for Minutes, Hours, Day). These charts can display any data provided as LML.chart_type in the input XML file for LLview. One chart instance is created for each chart tag in the XML file. With this option panel each chart can be configured individually. The panel allows to position and scale the chart as required. Most options available for Tk::Chart are mapped to chart options in LLview. With "chart type" you can choose whether to display your data as points, lines, bars or areas. A "zoom button" can be placed in a corner of the chart. When clicked a resizable dialog is shown containing only the selected chart. A chart can be used in a special mode, where each data set is connected to a job. Therefore, the name of the data set is given as "job::"<job-id>. In that mode a chart can be used to display only the currently selected job (mouse-down event). This is configured with the "single job" options. All other options are well explained in the options' tooltips. To simplify understanding what is shown by the LLview display, often short texts or images would be helpful. Annotations are a flexible way to add explanatory hints to the display. The number of annotations can be chosen with the "number" option. Note, that an LLview restart is required to apply changes to the number of annotations. All other options are specific to a single annotation. A single annotation is able to display a text, image and an arrow all at once. However, we would recommend to use an allocation for a single asset only. That allows you to place the annotations individually, while for a combined annotation the associated arrow, text and image need to be placed all on the same spot. The options "x" and "y" form the anchor for the annotation. The options in line 2 and 3 are only used for the arrow shape and location. The visibility of the annotation can be switched off entirely by the "show" option. The option line starting with "text" is used for the text annotation only. The following line specifies the image location, which needs to be given relative to the working directory of where you started LLview from or as absolute path.